In the Middle Ages Samarkand was called 'the Heart of the Great Silk Road', and Registan Square was called 'the Heart of Samarkand'. Registan Square is the main sight both of Uzbekistan and Central Asia as a whole. Situated in the elevated part of the city, this square with an ensemble of three madrassahs was built about 600 years ago. 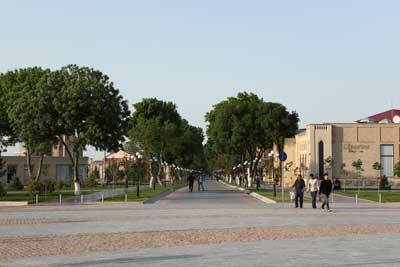 Very few cities in the world can boast of a square with the buildings of such an age to remain intact to this day. Guri Amir Mausoleum – Amir Temur's burial-vault is one of the best samples of the medieval Oriental architecture and one of the most significant monuments of Temurides' times. 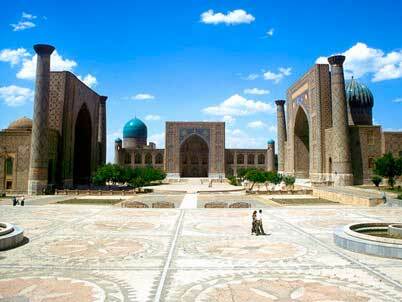 Its construction was initiated by Amir Temur in the autumn of 1404. The mausoleum was originally intended for Muhammad Sultan, Temur's beloved grandson and successor, who had died in Iran in 1403. 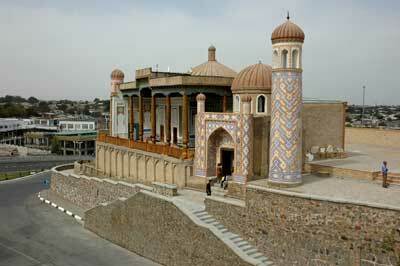 The grandest structure of Amir Temur's times is the chief Friday Mosque called Bibi-Khanum. Its construction started in 1339, after Temur's victorious campaign to India, and lasted up to 1404: that is, for those times the work was completed within a rather short time. 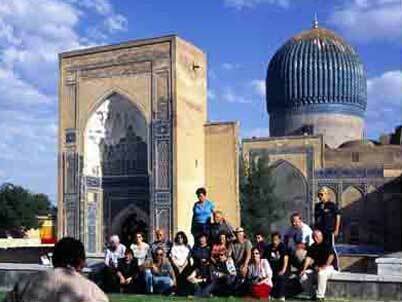 The best architects, craftsmen, stonemasons and artists from Samarkand as well as from the countries Temur had subdued, laboured at the construction of the Mosque. Shahi-Zinda Necropolis is one of the most visually stunning architectural monuments of Amir Temur's times in Samarkand. Initially the necropolis started at the end of the 9th century in the outskirts of Afrosiab, near the shrine of holy Kusam ibn Abbas, a cousin of the Prophet Mohammed. Yet mausoleums continued to appear near the sacred site as far as the mid-15th century. Kusam ibn Abbas was killed in a fight with pagans in Samarkand in the 7th century and was buried on the south-eastern slope of the Afrosiab site. 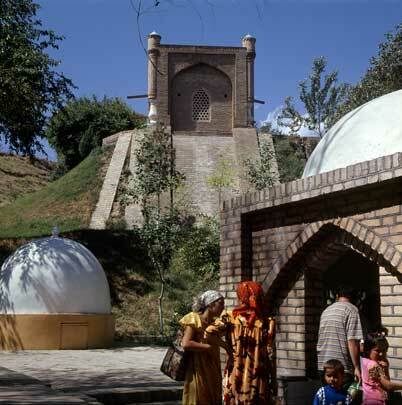 In the outskirts of Samarkand, on Kukhak hill, stands Ulugbek's Observatory – a unique historical and architectural monument. Having inherited the power over Movarounnahr from Amir Temur, his grandson Mirzo Ulugbek successfully combined royal duties with scientific activities. 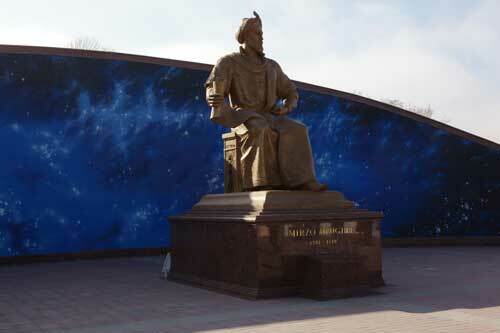 He is known worldwide as the founder of the famous Samarkand astronomic school. The ancient settlement of Afrosiab is situated on the spurs of Chupan-Ata hills to the north-east of present-day Samarkand. 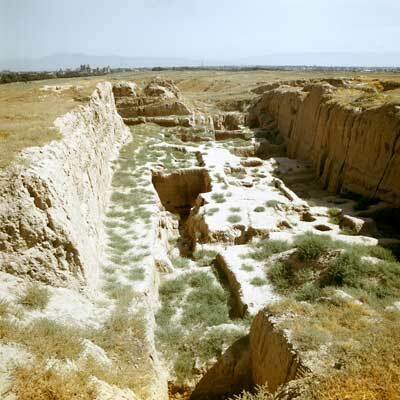 According to the legend, it was here, on the banks of the river Siab, that Turanian king and hero Afrosiab, a character of the folk epic 'Shahnama', founded the town that became the capital of Sogdiana. The first excavations on Afrosiab site took place at the end of the 19th century. From the mid-20th century the systematic research archeological activities have been carried out on the site. On the steep bank of the Siab River in the northern suburb of ancient Afrosiab settlement there is a tomb of Hajji Daniyar. He is equally held sacred by the followers of Moslem religion, by the Jews and Christians (under the name of prophet Daniel). According to the Bible, Daniel was a descendant of King Solomon and was born in the 6th centuries B.C. in Jerusalem. He served at court of King Nebuchadnezzar and successfully prophesied the future, for the God endowed him with ability to interpret "visions and dreams of all kinds", that is, to prophesy. The Rukhabad shrine is one of the earliest constructions that remained intact in Samarkand from the epoch of Amir Temur. 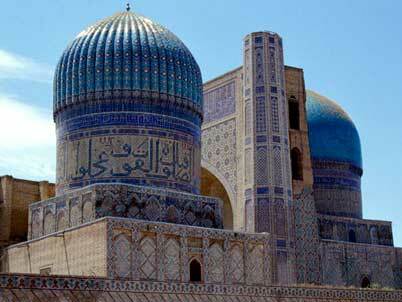 It was constructed in the 80-s of the 14th century, precisely on the same axis as Amir Temur's burial-vault. A magnificent shady avenue and a road paved with marble slabs used to connect these two constructions. 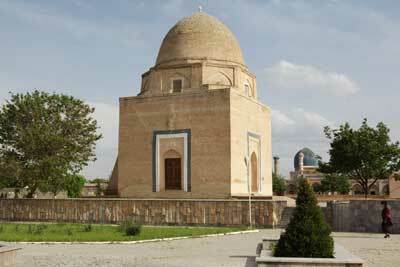 The mausoleum was erected over the tomb of the well-known Samarkand mystic Sheikh Burhaniddin Sagarji. 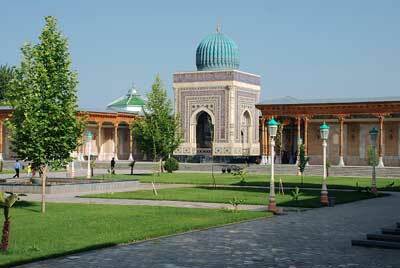 The Hazrat-Hyzr mosque is located on a hill almost opposite the Kusam ibn Abbas mazar (graveyard) in Tashkent Street. The building was constructed in 1823 and according to one vakuf document (document of endowment) it was integrated with Kusam ibn Abbas mazar into one complex. Both constructions were once connected by a lane. 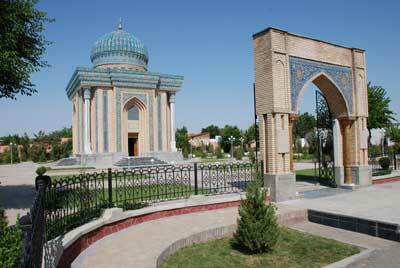 In the old part of Samarkand one can visit the Maturidy shrine. Abu Mansur Al-Maturidiy is one of the first theorists of the Islam religion. He immortalized his name as an originator of the Islam philosophical fundamentals doctrine. Subsequently this doctrine got the name "Maturidia" and gained wide popularity. 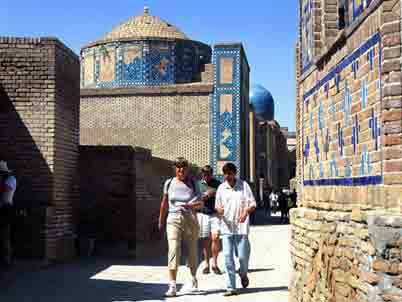 In Hortang village, located in twelve kilometers from Samarkand, there is one of the relics of the Moslem world - Imam Al-Bukhari Memorial Complex. The outstanding Sunni theologian Imam Muhammad ibn Ismail Abu Abdallah Al-Bukhari is known as the author of the most authoritative book after the Koran - "Al-Jami-al-Sahih" whichj is a collection of the most authentic hadiths (Moslem traditions). 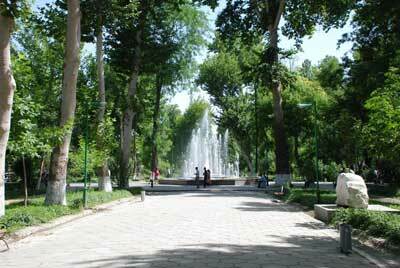 From Registan square there runs one of the most ancient Samarkand streets – Tashkent Street. In the old days it was one of the major caravan roads connecting Samarkand with Tashkent oasis, Fergana Valley and China. Trade has been carried on in this street since the times of Amir Temur. Thus it is not without reason that at the very beginning of this street, next to the walls of Sher-Dor Madrassah, there stands Chorsu shopping mall built as far back as the 18th century. From time immemorial on the extensive area in front of Bibi-Khanum Mosque, next to the main city gate, there has been a bazaar. And today the Siab bazaar - the city's biggest and the most ancient market– is full of hustle and bustle. 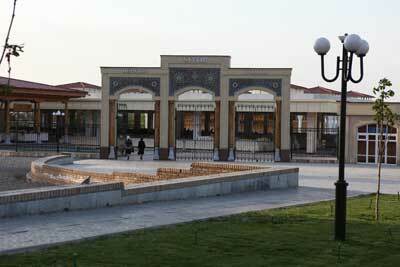 It welcomes the customers with abundance of fruit and vegetables growing in the fertile Zarafshan valley. In the very heart of Samarkand, for almost a kilometer from the hotels Afrosiab and President there stretches University Boulevard. In the shadows of century-old trees one can often see coveys of boys and girls with text-books and notes in their hands. This is not surprising, as one of the old constructions built up just along the boulevard is Samarkand State University, founded 80 years ago.